Save on new 2018 and prior year TRACKER® models during Model Year-End Clearance going on now! See your nearest dealer for complete details. 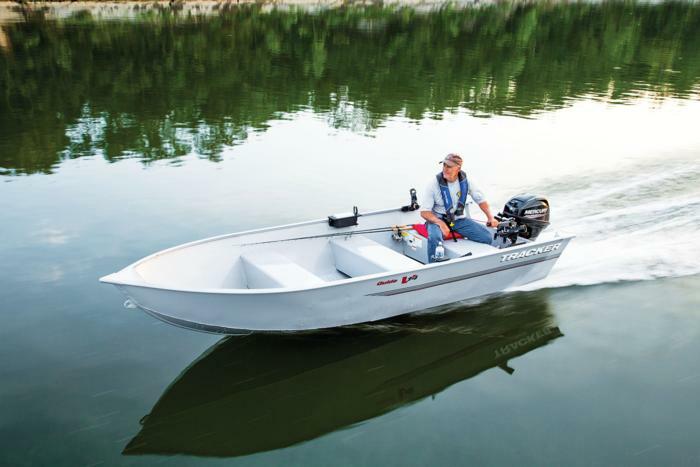 The TRACKER® Guide V-14 Deep V is our most economical Deep V, with a smooth-riding, stable, 2-piece hull with a welded-in transom. Built of durable, marine-grade .063 5052 aluminum, this all-purpose craft cuts through the chop with ease and will support up to a 20-horsepower motor. 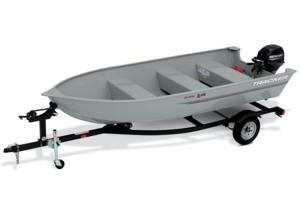 This rugged, no-frills utility boat sports 3 full-width bench seats with foam flotation beneath. With a generous beam of 5' 8" and a durable Starlite Gray powder-coat finish, the Guide V-14 Deep V can do it all, whether you're trolling for walleye or chasing big bass.